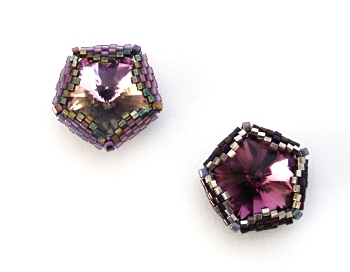 These geometric beaded bezels encase 14mm Rivolis or Similar and are ideal for adding a touch of sparkle to your work! This complete 8-page step-by-step tutorial contains all the instructions, diagrams and photos you will need to make your own version of the pentagons. A basic knowledge of peyote stitch (tubular, flat circular, step-ups, increasing and decreasing) is needed. These instructions are available as part of my Crystal Geometric Set. 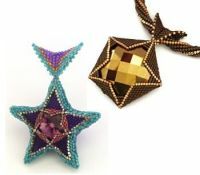 Note: these pentagons form the basis of my Geometric Crystal Stars, the instructions for which are available separately and which contain these pentagon instructions.